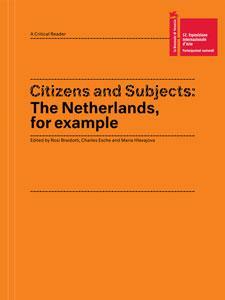 The critical reader Citizens and Subjects: The Netherlands, for example is a site where issues of fear, anxiety, and (illegal) immigration—but also cultural resistance and emancipation—are discussed through the example of the Netherlands, which stands here as neither a particular nor universal case for discussing the so-called western condition. It asks how art and artists can react to these issues and what possibilities they can create to see things differently. The reader is co-edited by philosopher Rosi Braidotti, curator and writer Charles Esche, and Maria Hlavajova. With contributions by: BAVO (Gideon Boie & Matthias Pauwels), Sarah Bracke, Esther Captain & Guno Jones, Halleh Ghorashi, Sven Lütticken, Soheila Najand, Henk Oosterling, Baukje Prins and Iris van der Tuin. Further, the reader includes conversations with artists Marlene Dumas, Suchan Kinoshita, Aernout Mik, Melvin Moti, Willem de Rooij, Pages (Nasrin Tabatabai & Babak Afrassiabi), Lawrence Weiner, and Jos Werner. Who Dares to Experiment with Culture? The ‘Droste Effect’ or What Comes after Being Critical?